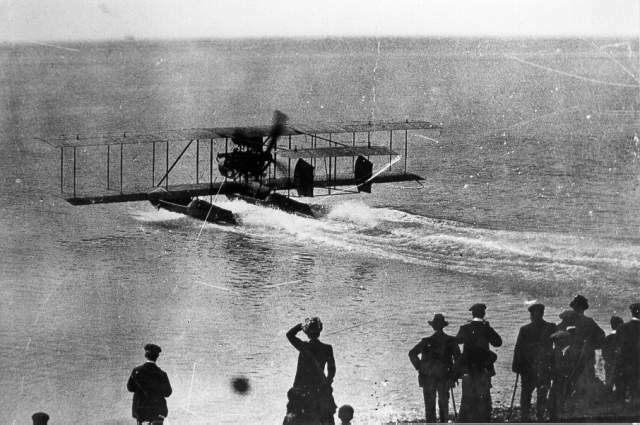 Gordon England's "Radley-England" Amphibian, May 1913; an early seaplane taking off from Kemp Town Beach, with spectators at the water's edge. 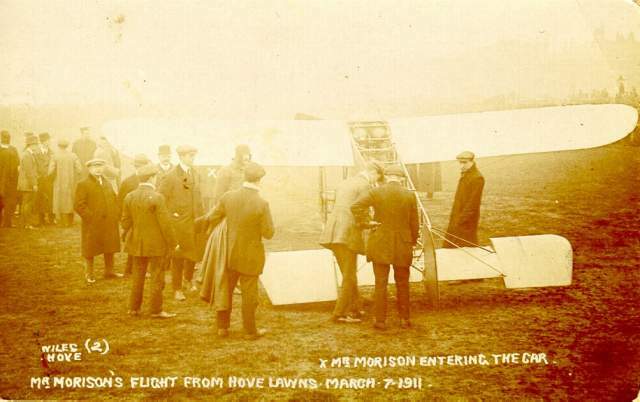 Mr Oscar Morison's Flight from Hove Lawns, March 7 1911: Earlier On 15 February he had flown a Bleriot monoplane from Brooklands Aerodrome near Weybridge to Brighton in one hour, landing by mistake near the Banjo Groyne. Meanwhile, a pioneering centre of aviation was becoming established some 6.5 miles to the west of Brighton in the parish of Lancing. The first flight was made on 10 July 1910, and the Shoreham flying ground was officially opened as Brighton Aerodrome on 20 June 1911. During the First World War the land was requisitioned by the Royal Flying Corps and after 1918 the land was returned to grazing, but the airport started again in the early 1930s with the first scheduled passenger flight made in October 1932. Services to the Isle of Wight, Croydon, Deauville and Jersey were established, and on 13 June 1936 the airfield was officially reopened as the Brighton, Hove and Worthing Municipal Airport, under the joint control of the three boroughs; a railway station also opened adjacently. The Art Deco terminal building, designed by Stavers H.Tiltman, is now listed and is often seen in television productions depicting the 1930s. The following year 6,000 passengers used the airport, but it was again requisitioned as a fighter base in the Second World War. Municipal control was re-established in 1951, but the whole airport was leased to F.G.Miles Ltd and the Beagle Aircraft Co. until 1971, with just a few scheduled flights made in the 1950s. Shoreham Airport reopened as a municipal airport in May 1971 and a 900-yard hard runway opened on 1 July 1982; this is too short for all but the smallest passenger aircraft, however. Scheduled flights to Jersey and France were resumed for a short period, but Shoreham, one of the six oldest licensed aerodromes in the country, remains the earliest still operating. I took my first ever flight from Shoreham during the early 60s. My brother and I flew in an Auster based at a small hut on the Adur side of the airport. For 15 shillings we flew along the coast to the Palace Pier and back.